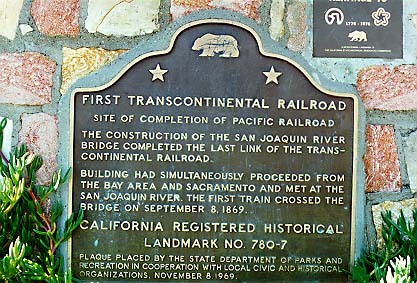 The construction of the San Joaquin River bridge completed the last link of the transcontinental railroad. Building had simultaneously proceeded from the Bay Area and Sacramento and met at the San Joaquin River. The first train crossed the bridge on September 8, 1869. From I-5 take Louise Ave exit. Take W side frontage road (Manthey) S 1.8 mi to entrance to Mossdale Crossing Park and Ramp, 2.0 mi N of intersection of I-5 and I-205, Tracy.